When Jim and his team appeared as monsters with Arthur Godfrey on The Ed Sullivan Show on Christmas Eve, 1967, he and writer Jerry Juhl were in the midst of a particularly fertile period in their creative collaboration. Along with the short scripts for the numerous variety show appearances they were producing, Jim and Jerry were churning out long-form concepts for television specials and experimental films, and proposals for features, series, and theatrical reviews. 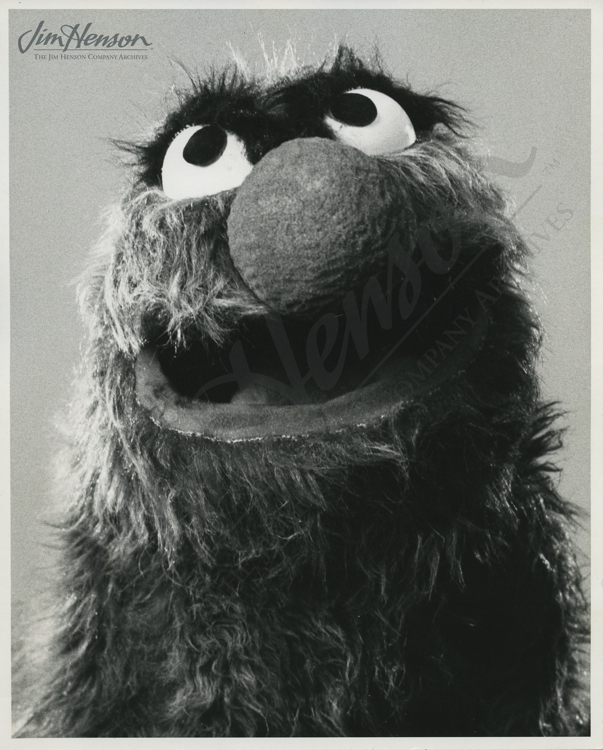 These ranged from Muppet ideas like “The Adventures of Rowlf in Outer Space” to live-action films like the abstract “Tale of Sand” or “Moki,” a convoluted story about a cross-dressing boy in the world of high fashion. 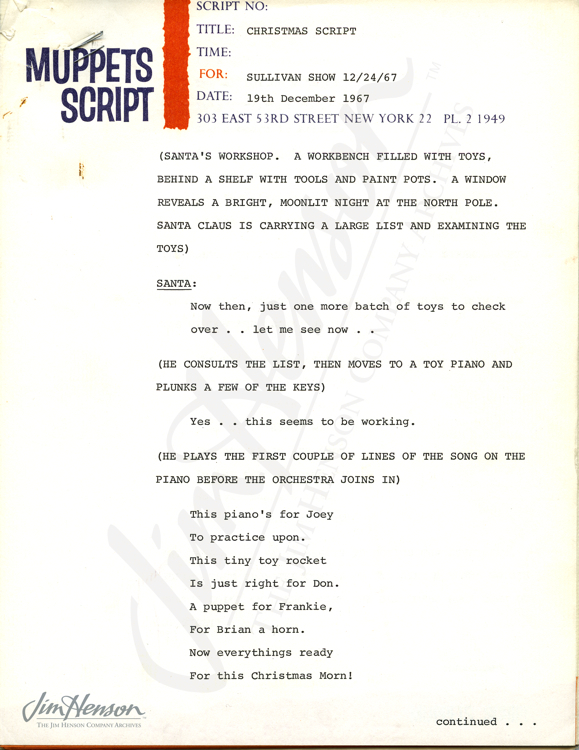 One script that was clearly a favorite had been in development since 1963, “The Great Santa Claus Switch.” Through various revisions, the story revolved around a group of bad guys with a nefarious leader (first a witch and then a wizard) whose greed inspired them to infiltrate the world of elves and Santa Claus in an effort to take possession of the gifts and joys of Christmas. With a green light and production of that special three years away, (it was eventually produced in 1970,) Jim and Jerry clearly had the story in mind when they conceived their Sullivan Christmas eve appearance. In the bit, Santa, played by broadcast personality Arthur Godfrey, is visited by a group of furry monsters just as he is sorting out which toys go to each child. The leader, a large live-hand monster named Thudge (performed by Jim in a voice similar to Rowlf,) explains that they are there to steal the toys for their own benefit. Among his cohorts is a greenish version of pre-Sesame Grover, named Gleep, representing one of Frank Oz’s early efforts at voicing a character. After Thudge threatens Santa, Santa says he will make a gift of the toys to the monsters instead. They are flummoxed, and, making a Grinch-like transformation, show concern that there won’t be toys to deliver to children. Santa assures them that there is enough for all and sings a joyful song. Sobbing their thanks, the monsters join in, and in a typical Henson way learn the much expressed Henson message of sharing and acceptance. Arthur Godfrey, while clean-shaven, made a charming Santa and seemed comfortable interacting with the Muppets. This may have been because a decade earlier, a twenty year old Jim and his Sam and Friends characters had appeared on Godfrey’s television show (December 18, 1956.) Ed Sullivan clearly enjoyed the bit, too. 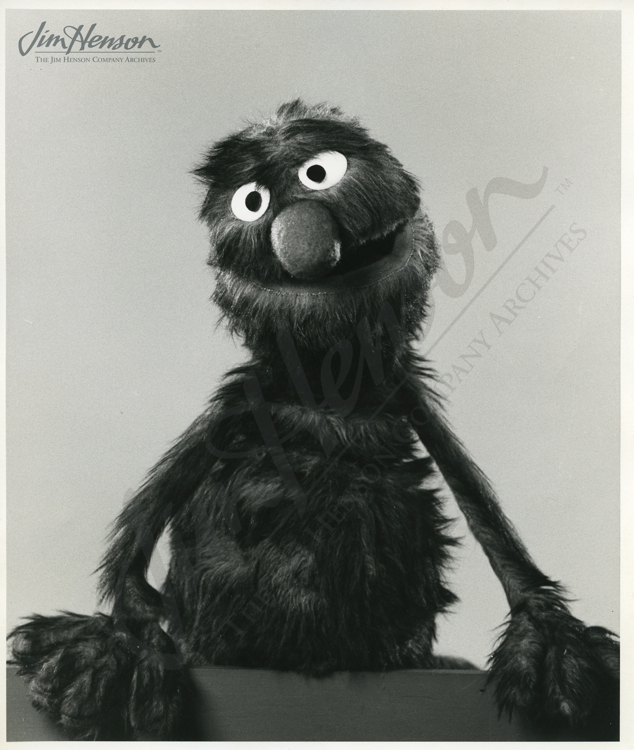 Not only did he welcome the Muppets back on his show on numerous occasions, but his company served as producer for The Great Santa Claus Switch, airing it in Sullivan’s Sunday night timeslot. 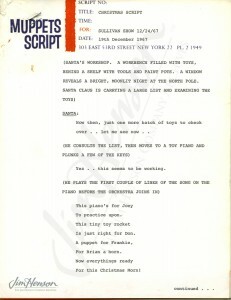 Script by Jim and Jerry Juhl for an Ed Sullivan Show appearance, December 24, 1967. Thudge, a Christmas Monster who appeared on The Ed Sullivan Show, December 24, 1967. Gleep, a Christmas Monster (and Grover prototype) who appeared on The Ed Sullivan Show, December 24, 1967. This entry was posted in 12-December '67, 1967, Appearances and tagged Christmas, Godfrey, Sullivan. Bookmark the permalink.